Attorney Agnieszka “Aga” Piasecka has an excellent reputation in Florida and in Poland. As you can see by her reviews Aga Piasecka’s clients are consistently impressed by her performance in the courtroom and her knowledge of the law in Florida and in Poland. She also receives excellent reviews because of her honesty and ability to explain complex legal matters in a way that her clients can easily understand in Polish and English. Attorney Agnieszka Piasecka also gets 5.0 stars reviews from her clients because she is very hardworking and always accessible to her clients. Many of her clients mention on their reviews how kind and caring Attorney Aga Piasecka is and recommend her highly to all of their family and friends. Below, are just a few of Attorney Agnieszka Piasecka’s reviews. Please check back frequently as we will be posting more reiviews for Aga Piasecka, Esq. in the near future. After procrastinating for years and not working on our much-needed estate plan, my husband and I finally contacted an attorney to begin the process. We did our usual “internet research” and decided to call Agnieszka Piasecka. We had no idea how lucky we were in our selection until we began to work with her. Our first contact with Ms. Piasecka was over the phone. Yes, she actually answered the phone and returned every phone call thereafter. What’s more, she was very patient to explain our options, answered many (many) questions and never once made us feel uncomfortable about our lack of legal knowledge on the matters we discussed. She carefully led us through every consideration, took a true interest in understanding our wishes and drafted a total estate plan package that fit us perfectly. When we finally met her in person to complete everything, the interaction was amazing. She wasn’t looking for a bunch of “billable hours” to complete the effort. In fact, she even took the time to meet with us while everyone else was gone and preparing for the Christmas holiday. She went above and beyond what I ever expected from an attorney. She took the stress out of the process and I would work with her again in a heartbeat. If you need an exceptional estate planning attorney, look no further – Agnieszka Piasecka will not disappoint you. I was able to get all of my questions answered and my issue resolved quickly in court. I would recommend this laywer to friends. Agnieszka has been excellent for us. She has shown than not only is she very competent with extended knowileage in her field, but her comitment to our case was amazing. We have been extremely well looked after by her, she has always been there for us, I am sure she spent more time on our case, then she charges us for. We would recommend her services without any hesitation. Pani Piasecka jest świetnym a co ważniejsze bardzo skutecznym prawnikiem. W mojej sprawie zachowała się bardzo profesjonalnie i spełniła moje oczekiwania. Jestem z jej pracy bardzo zadowolony i polecam wszystkim. Piotr M.
I have used Legal Services of Aga Piasecka for personal planning (trust, will, medical directive, etc.) as well as family law matters (custody, parental plan, etc.). She always responded quickly and in detail giving great advise. Aga has walked me though everything in detail and I always felt informed and in the loop on the process. I highly recommend her services. Thanks to her I was able to navigate a stressful situation quickly, efficiently and with reduced stress. Agnieszka went beyond and above of what I had expected from an attorney. After few bad experiences I was very happy I had fount her. She prepared my will in a very timely manner and was always available whenever I had a question. I retained Ms.Piasecka for my divorce case. She gave me first consultation for free and was very professional. She explained everything to me and answered all my questions. She also was kind and pleasant as a person which is very important. She called me before each appointment to make sure I remember to be there and overall I was just very pleased. I would highly recommend her. I retained Aga to represent me during a foreclosure case. Aga was diligent, hard working, quick to respond, and always made herself available when questions or concerns arose. Aga is extremely knowledgeable in this area of her practice and was able to clearly explain each step of the process, potential outcomes, and what to expect. She was able to develop a defense which resulted in a waiver of deficiency in my case which was beyond my hopes and expectations. I highly recommend Aga and would most definitely retainer her again or refer her to others. We met Agnieszka at her office to get Wills and other documents we needed to get in order. Agnieszka was puntual and dressed professionally. She was well prepared and explained all the forms in a detailed manner, also answered all of our questions. She is not only an attorney but, also a very nice, friendly and parient lady.. I would definitely recommend using her services and we will certainly use her again in the future. I highly recommend Agnieszka Piasecka! 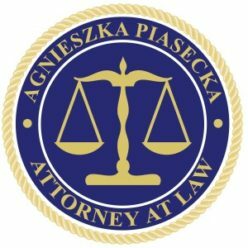 I highly recommend Agnieszka Piasecka to anyone who needs help with solving their legal problems. She is very professional and efficient but at the same time she is just a very nice, caring and understanding person, which makes it much easier to work with her. Agnieszka has an extensive knowledge of legal issues and a lot of experience, both in US and Poland, which helps her understand her client’s needs in a better way. She explored all circumstances and analyzed all possible solutions in order to achieve the results I wanted when I hired her. She helped me in a very complicated legal matter, she did it fast, but never lost sight of giving me the highest quality service. She explained all the legal technicalities in a way I could finally understand. I will definitely hire her again, if I need a legal advice in a future. We are very happy with the professional service that Ms. Piasecka provided. She is very knowledgeable and sensitive to our needs. She is punctual, accommodative, and respectful of our time due to our travel. I highly reccommend her, especially that she was able to translate all of our documents and explain to us in Polish. Agnieszka was fantastic to work with. She always made time to speak with me directly, she was very knowledgeable and professional throughout the process. I strongly recommend her for your legal needs. I will be using her again for additional legal services for estate planning since my first experience with her went so well. W mojej sprawie pani mecenas pomogła mi bardzo profesjonalnie. Gorąco polecam. Świetny adwokat. I hired attorney Agnieszka Piasecka for my divorce and she was great. Very professional and knowledgeable about the law. She handled my case very well and achieved all my goals. She was always available to talk to me personally and not through assistanants and always throughly explained all my options. I highly recommend this attorney to anyone who is looking to hire an excellent and honest divorce lawyer. The consultation with Ms Piasecka by phone and in person was very efficient, professional and courteous. She is a pleasure to work with due to her knowledge and personality. I will come back to her with my future needs for legal assistance and I’ll recommend her services to my friends. I would like to thank you Agnieszka Piasecka Attorney-at-Law for her excellent services. She demonstrated professionalism and was very knowledgeable about all the processes, was very responsive to all questions I had. I highly recommend her. Agnieszka Piasecka is the best attorney! I highly recommend her to everyone who needs a great lawyer, who really cares about her clients. She helped me in a very difficult situation with my divorce and achieved excellent results for me that I didn’t even expect. Agnieszka is very professional, ethical and compassionate. If you need the best divorce attorney you could find, look no further. My wife and I hired attorney Agnieszka Piasecka for our estate planning (trust). Ms. Piasecka was extremely knowledgeable and very professional. She was especially nice, and immediately put us at ease and took time to thoroughly explain all of our legal options. She also promptly returned our calls and answered all our questions. Overall, we were very happy with her services and will definitely recommend her to all our friends. We are extremely satisfied with attorney Agnieszka Piasecka! Jestem zachwycona wspolpraca z Pania Agnieszka. Mila, bardzo profesjonalna i w ekspresowym tempie odpowiada na wszelkie watpliwosci. Bardzo pomogla nam w procesie o zielona karte. She and her staff helped me set up trus documents for me and my family and helped me set up a will as well. Aga is very friendly and knowledgeable, she answered all my questions and accommodated to my hard schedule. Every thing was over the email and phone until we met to sign the paperwork. Great big five stars well deserved to Aga and her staff. Will consult with her in the future! Agnieszka is such a great lawyer. I did not comprehend many of the immigration papers and terminologies I had to deal with, and she made everything easy to understand. With her tremendous help, my husband became a permanent resident. Now she is helping me with my mom’s citizenship papers. I am so thankful to have her and will 1000% recommend her to everyone, she is an amazing lawyer! Attorney Agnieszka Piasecka helped in the process of K-1 visa which was successful and my fiance got his Visa. She’s did an excellent job especially when it comes to availability; responding to my phone calls, email and appointments. I highly recommend her. I’m currently looking forward to begin the next step of adjustment of status and will definitely used her and other future legal services. I am very happy that I found out about Agnieszka Piasecka – I had a big problem with moving my immigration case forward on my own. Then I realized that I could lose it. Fortunately, I just got to Agnieszka Piasecka. She responded very quickly, prepared all the documents and sent, I received copies of all the documents she was preparing. we waited for a reply and finally came, the case was approved. I know that without the help of this lady, I could not see my mother back. I am grateful for all life for the work she has put in my case. I had a pleasure to hire Ms Agnieszka for my immigration case. I’m very pleased with the outcome and the entire process. She filled all my forms, submitted it on time, was available all the time and responds to any queries on time. She knows her subject and laws pretty well and gives a fair and accurate idea of the case based on current situation. She is also reasonable on the fees as well and works to resolve any issues. Attorney Agnieszka is the type of lawyer every client wants and someone I highly recommend. She helped me thru the entire process of marriage, then also thru divorce and on top of that provided me with answers on all type of questions I had like immigration issues etc. She is very detailed and professional lawyer. She is as good of a person as she is an attorney. The best lawyer you can have when you are going through a difficult situation. She helped me with an immigration issue, which was giving me really hard time. I feel so safe and secure to have her my personal attorney. In case of any issues I make a call and she suggested the right thing to do. She always takes care of her clients interest first rather than looking what will help her business wise. I am really lucky to find such a gem of person as my advisor/attorney. She will always be my attorney. Pani Agnieszka bardzo nam pomogła z naszą sprawa imigracyjna. Jest bardzo profesjonalna i miła. Polecam jej usługi. Aga made the whole process go by like a breeze. She did an amazing job with the case and I will defiantly go to her again. Ms. Piasecka was found through a legal service that my wife are members of. She was being asked to handle a small claims court case in Florida. I live in Illinois. She responded to my initial call on the same day. After getting her more details about the case on day 1 she came up with a plan 2 days after that initial call. Agnieszka was willing to speak with me on the phone each time I called. She also made sure I fully understood what was going on each step of the way. By the 5th day after my initial call she was filing motions on my behalf. The case settled quickly. I found Agnieszka to be very friendly, helpful, and concerned. I noticed that she quickly began strategizing on how to handle the case. I would gladly recommend her to any friend needing legal help. I hired Agnieszka as my attorney for a case, and I couldn’t be happier with the whole process. She did an excellent job of going step by step explaining the process and taking care of the case. I would hire her again for any future cases, and I even recommend to some friends and they were very pleased with the results. Agnieszka Piasecka an excellent attorney acting in an excellent manner represented us to immigration to receive a green card. We are very satisfied with her professionalism and caring in this matter from start to finish. Consequently, a green card was issued by immigration In timely manner. Thank you attorney AGNIESZKA PIASECKA for all your help in this matter. I would highly recommend AGNIESZKA PIASECKA to anyone needing an excellent lawyer who really cares about her clients. Sincerely, very satisfied client. THANK YOU JESUS (GOD) !!!!!!!!!!!!!!!!!!!!!!!!!! Ms. Agnieszka handled an overseas immigrant visa process for our family. Ms. Agnieszka, was extremely helpful, very professional, and efficient in guiding us from the start to a very successful finish of our family immigration process. In addition, she was successful in interfacing with the National Visa Center (NVC) in the States and the US consulate overseas to expedite the immigration process based on our family situation. We highly recommend Ms. Agnieszka for anyone who needs a professional representation and guidance with immigration process and other legal needs. It is a wonderful pleasure working with Ms. Agnieszka. Ms. Piasecka We graciously thank you for all your hard work for a Job Well Done. Aga, Thank you for helping me reconnect with my Daughter. When a relationship fails and there are children involved, emotions and uncertainty can become overwhelming. Child Support and Custody matters are not always things someone prepares for. In my situation I felt almost completely consumed by this. With your help and guidance I was able to navigate through the uncertainty of court proceedings and ultimately begin to restore the relationship with my daughter. Aga kept me informed throughout the entire process, was professional and courteous. My daughter and I are now able to spend time together and focus on moving forward in life. If your considering an attorney to represent you in a child support/child custody or other family situations, I would strongly suggest working with attorney Agnieszka Piasecka, she helped me and she can help you too. Thank you again! Very professional, nice and helpful lawyer. She always answer my questions by e-mail or phone. I’m very satisfied. Bardzo polecam Panią Agnieszkę. Jestem bardzo zadowolona z jej pomocy. I would highly recommend Agnieszka Piasecka as your future lawyer! We worked together on finalizing my Green Card Process and I can’t imagine anybody who could assist me better with professional help! 10/10! The lawyer Agnieszka Piasecka was very quick in communicating about the progress of our case. She is a great people’ s person and great listener also. She not only showed her knowledge about American but also Polish law. Our immigration case was complicated but with the competency of Agnieszka Piasecka we achieved the desired goal and my husband and I can be together. Agnieszka will take care of all your needs, in a kind professional manner! My wife and I came to Agnieszka seeking to do a step-parent adoption, so that I could finally adopt my son. She was prompt, courteous, kind, and professional. She listened to our needs and accomplished the adoption in even less time than she quoted it might take. Now, because of her expertise and professionalism, I am finally able to call my son, mine. I will continue to seek her counsel for any needs I have that may come up and will recommend her to family and friends, over and over. Ms Piasecka provided excellent service for my family. I would certainly recommend her. Agnieszka had a great approach and follow-up our case in professional manner.We certainly would ask her for her support in the future. Over the past year I have hired and consulted with Ms. Piasecka on several family law matters including immigration needs. Ms. Piasecka professional service, responsiveness, and expertise to address her client(s) is truly un-match. I regret I did not meet her when I needed legal representation during my divorce. I am provide this review based on my experience with three previous attorneys and God is my witness. Ms. Piasecka is top notch attroney, pays attention to details and her client(s) needs. She always responded to my phone calls, emails in person not through a legal assistance or a secretary, what world difference she is. If you need legal help or representation please do not second guess her expertise you will never regret hiring her. Agnieszka Sylwia Piasecka gets the job done! Attorney Agnieszka Piasecka provided accurate and professional advice, made suggestions we had not considered, and alleviated our stress level, by identifying elements that were not relevant to our situation. She effectively negotiated with the other party and got the case resolved in a very short period of time. She followed through and worked with all parties involved to collect needed information. She was well prepared throughout the process. She had a back plan ready, in case the initial plan did pan out. Our family is very grateful for the professional services provided by Ms. Agnieszka Piasecka. I hired Mrs Agnieszka to help me with my divorce.She did excellent job,always on time,always answering my questions by phone or mail,I’m very satisfied and highly recommend her. Professional and easy contact person. Bardzo goraco polecamy te wspaniala polska Pania Prawnik. I recommend Agnieszka Piasecka to any person that needs a lawyer. She is very good at what she does. Goes above and beyond in assisting her clients. I appreciate the special attention and understanding she gave to me… Thank You so much.. I hired Attorney Piassecka to help me set up my trust and living will. She did an excellent job in making the process way simpler and efficient. She guided me throughout the process and took her time in explaining every details in a way that I can fully understand. She was able to captured the exact information that I want to be stipulated in my trust and living will. I will highly recommend her to my friends and family. Agnieszka Piasecka helped me and my wife in the court case against unlicensed hairdresser, who damaged my wife’s hair. Mrs. Piasecka was emphatic and professional. Now the case is closed, and we are very satisfied with the result of her work. Agnieszka is wonderful to work with! She is very hard working and dedicated and really cares about the client. She has gone above and beyond to help us solve our problem. She has an amazing attitude and I highly recommend her. I hired Agnieszka Piasecka to help me with my divorce. She did excellent job. Was always answering my questions no matter what time I asked. Highly recommend. Agnieszka always responded my questions same day, unless I decided to email her late in the evening, she would get back to me the next morning or afternoon. She was very thorough in her explanations and always did what she said she was going to do for us. I really appreciated her professionalism! Pani Mecenas Agnieszka Piasecka Jest Wspanialym Mecenasem Zalatwila mi sprawe 100% ,moge spac spokojnie. W zwiazku z powyższym polecam jej pomoc wszystkim tym, którzy jej potrzebują. Aga was a very thorough and detailed about the steps the we needed to take for my case. She also kept me informed with what was going on each step of the way. I’ve already recommended a friend and I will use her for any future legal needs. Agnieszka, handled my case perfectly. Usually tenants constantly lose against landlords. With my case, she showed great professionalism and attention to detail which led us to win the case against my landlord. I recommend her to anyone who has an issue. She is very fair. W wyjątkowo ciężkiej sytuacji życiowej mieliśmy szczęście stać się klientami pani Agnieszki Piaseckiej. Problemy związane z zatrudnieniem spadły na nas do tego stopnia niespodziewanie, że mieliśmy zaledwie kilka godzin, aby znaleźć adwokata. Mimo że zgłosilam się do pani Piaseckiej w piątek późnym wieczorem, odpowiedziała od razu. Podczas pierwszej rozmowy wykazała się wielką życzliwością i zrozumieniem dla naszej trudnej sytuacji. Po przeanalizowaniu naszej sytuacji zgodziła się nawet poświęcić nedzielę na spotkanie z nami i dokładne omówienie naszych szans w sprawie. Pani Agnieszka profesjonalnie przeprowadziła szereg rozmów z adwokatem strony przeciwnej. Mieliśmy możliwość śledzić ten proces i szczerze mówiąc, adwokat ów był osobą niechętną do ustępstw. Mimo to pani Piasecka w błyskotliwy sposób wywalczyła dla nas najlepszą formę ugody. Poza profesjonalizmem i wiedzą, panią Agnieszkę cechuje życzliwość i otwartość. Gorąco polecamy-jest to właściwa osoba na właściwym stanowisku, która po prostu wie, co robi. Zatrudniliśmy Panią Agnieszkę do naszej, niełatwej sprawy. Pani Agnieszka bardzo się zaangażowała i poprowadziła sprawę wyśmienicie. Jestem bardzo zadowolony ze współpracy z Panią Agnieszką. Polecam gorąco. Aga Piasecka is the best attorney that we have ever worked with. Her professionalism and legal expertise are impressive! We were able to discuss our situation with her in a friendly atmosphere and after taking the time to listen and understand our position, she honestly and kindly explained the different options available to us. We felt very comfortable with her representing us. Frankly, we were pleasantly surprised to find an attorney in this area who was always accessible, affordable, compassionate and able to solve our legal issues so efficiently. We highly recommend Aga without reservations. Excellent experience. Professional bilingual service. Highly recommended. Consultation in legal matters in the state of Florida and in Poland. Comprehensive advice. Thorough preparation. Konsultacja prawnicza w sprawach regulowanych przez prawodawstwo stanu Floryda i Polski. Rzeczowe, profesjonalne podejście ze strony pani prawnik, wyczerpująca informacja, pomoc w rozwiązaniu nawarstwiających się od dłuższego czasu problemów, włącznie z rozmową telefoniczną z przedstawicielem instytucji, z którą prowadziłem negocjacje. Pani Piasecka prowadzi sprawy i udziela porad w języku angielskim i polskim. Jej – dziękuję, Państwu – polecam. Agnieszka is a great attorney, honest, caring and kowledgeable. I fully recommend Agnieszka jest swietnym prawnikem – uczciwym i kompententnym. Bardzo polecam! I was very impressed by Attorney Aga Piasecka she is honest, hardworking, very knowledgeable and a force to be reckoned with in the courtroom! I was extremely impressed with how well prepared she was and how easily she won my case. I would highly recommend Aga, and would hate to be on her opposing side! Agnieszka is a very good attorney. She is helpful, kind, responsible and verbal. It is nice to work with Agnieszka and Great to have her on your side. We strongly very pleased with the work of Agnieszka and we recommend to all those in need a good lawyer.